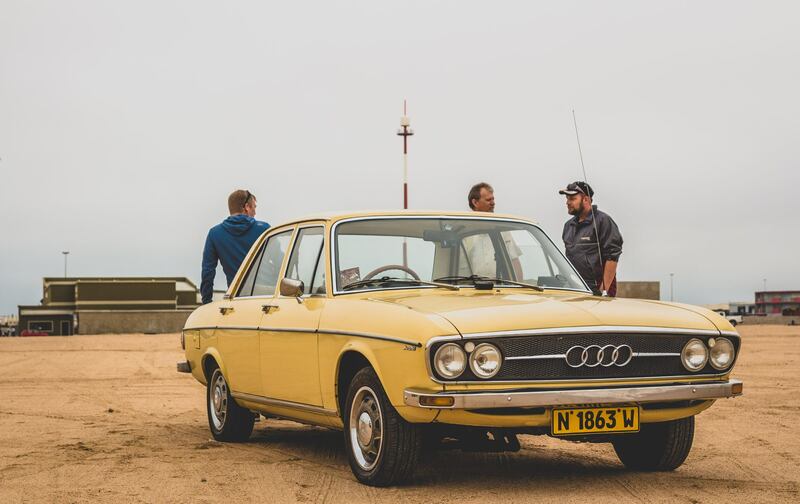 Our Car for the Rough an Tough Rally 2018 is a pure 70’s custard color 1974 Audi 100 L.
The first Audi 100, developed by Volkswagen’s subsidiary Auto Union at Ingolstadt, was shown to the press as a four-door sedan on 26 November 1968. Its name originally denoting a power output of 100 PS (74 kW), the Audi 100 was the company’s largest car since the revival of the Audi brand by Volkswagen in 1965. The C1 platform spawned several variants: the Audi 100 two- and four-door saloons, and the Audi 100 Coupé S, a fastback coupé, which bore a resemblance to the Aston Martin DBS released a year earlier, especially at the rear end, including details such as the louvres behind the rear side windows and the shape of the rear light clusters. The Audi 100 included a rough engine note that was described as unlikely to discourage buyers whose first car had been a Volkswagen and who aspired to drive a diesel powered (pre-turbo) Mercedes-Benz. The Ingolstadt production line was at full capacity, but supply fell short of demand that during the summer of 1970 an additional production line for Audi 100s was set up in Volkswagen’s own Wolfsburg plant, which made it the first water-cooled car to be produced in Germany’s (and by some criteria the world’s) largest car plant. Starting with the 1972 model year, the 80 and 90 PS versions were replaced by a new regular-petrol-variant of the 1.8 litre engine developing 85 PS (84 hp/63 kW); at the same time, the 100 GL was introduced featuring the 1.9 liter engine formerly used only in the Coupé S.
In September 1973 (for the 1974 model year) the 100 received a minor facelift with a somewhat smaller squared-off grille, with correspondingly more angular front fenders, and with reshuffled taillight lens patterns. The rear torsion bar was replaced by coil springs. For model year 1975 the base 100 was re-christened the 100 L and received a 1.6 litre four-cylinder engine (coming out of the Audi 80). A four-wheel drive prototype of the Audi 100 C1 was built in 1976, long before the appearance of the quattro. In South Africa, where the 100 was also assembled, the 100 was available as the L, LS, GL, and S Coupé. Local production began towards the end of 1972; by October 1976 33,000 units had been built in South Africa.The GL received a vinyl roof and “GL” lettering on the C-pillar. The LS was dropped for 1976, but returned for 1977 along with the new GLS saloon. The Coupé was discontinued. The LS and GLS were special versions of the L and GL, with silver paintjobs, automatic transmissions, and special red interiors. L and LS have a 1760 cc engine with 75 kW (102 PS; 101 hp) DIN, while the GL and GLS have the larger 1871 cc engine producing 84 kW (114 PS; 113 hp). Now our Audi 100L is a 1 owner car( well 2 now) with 95 000 KM’s original km’s on the clock. We had a few issues getting it road going again, like finding shocks that fit( few modifications got that sorted). Our major issue was tracking down a replacement water pump. Nobody in Namibia has even had one in stock and South Africa wasn’t looking promising. Thank goodness for Ebay at the end of the day. Had it shipped from Germany and a few weeks later the car was at the coast. The picture above is the car in stock form. We not keeping it stock. Now given the car is probably the only one of its kind in the country still running, we not going to be making major changes to the car. For now just a few improvements to protect the engine and radiator, and then make it look more Rally. There will be a follow up post soon with some more info. Rough and Tough Rally 2018 – 24th to 27th May – In aid of Cancer association of Namibia.